It’s easy to forget sometimes that just 24 months ago there had never been an AFLW match played and that for most Australians women’s football was barely on the radar. The AFLW fanbase, myself included, is impatient for the league to become what we know it can and will be in the future, but it would be a mistake to focus too much on what AFLW is yet to achieve if it means neglecting to recognise and celebrate what the league has already accomplished. 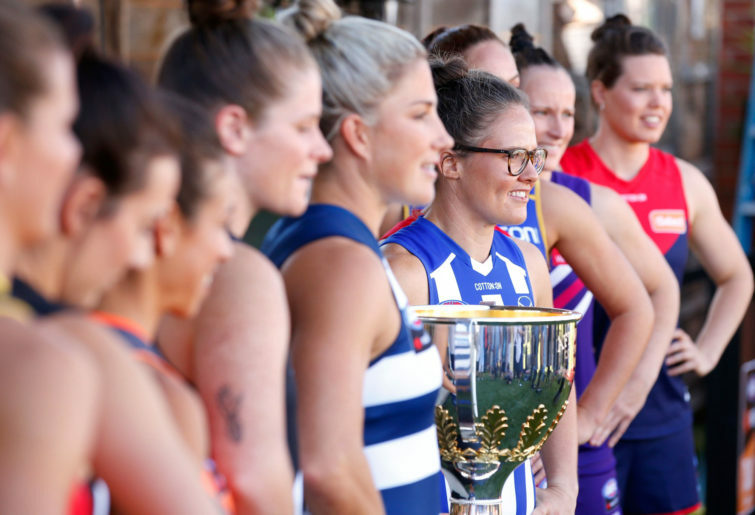 To start with, AFLW has successfully become a fixture of what was an already jam-packed Australian sporting calendar, and it is not just holding its own in that space, but expanding. Two new teams are arriving in the league this season in North Melbourne and Geelong, and four more – West Coast, Richmond, St Kilda and Gold Coast – will join in 2020. That will leave the AFLW just four sides short of a full complement of the AFL’s 18, and give the administration a rich base from which to expand the length of the season when they decide to do so. It also means an extra 60 women are getting the chance to be AFLW players this year, and then a further 120 next season (which will make for a total of 420 active AFLW players). 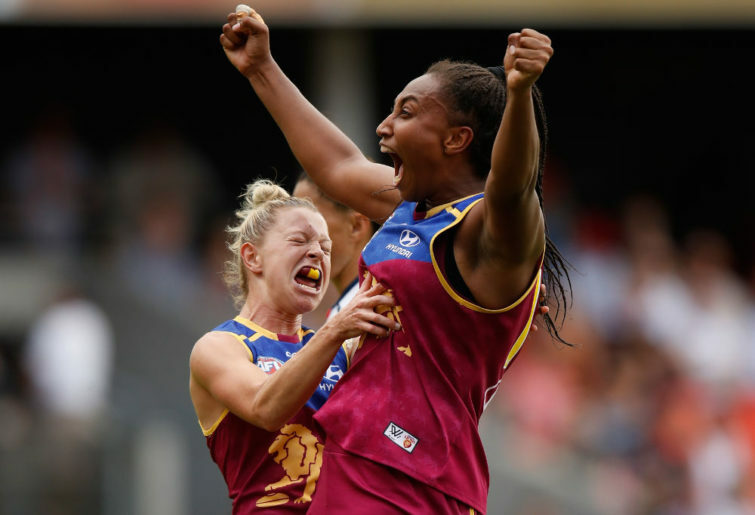 After receiving no rights fee for the first two AFLW seasons, the AFL last year signed a broadcast deal that will bring in $2 million over the next four years. The broadcast deal will also see the number of free-to-air matches increase to two per week for season 2019, and three in 2020, with all other games to be broadcast live on Fox Footy. Perhaps most importantly for the future of the sport, the advent of AFLW has drastically increased both the strength and visibility of the VWFL and the women’s U18 competition. Participation numbers among girls and women have boomed, and there’s now not only a clear picture of what the top level is, but a distinct pathway to reach it. This is where the increasing number of free-to-air games becomes particularly valuable – it’ll see more young girls exposed to the sport, which leads to the strengthening of the competition, leading back to yet more exposure. Compare the AFLW’s three free-to-air games per week from 2020 onwards to the A-League (one free-to-air game per week) or Super Rugby (none), and you can see that AFLW is in a good position for future growth. The quality of the competition too, albeit across a small sample size, is already trending upwards. This is true of women’s sport more generally as well – for a quick example, look at how the rate of scoring and number of sixes has increased in the WBBL over four years. Meanwhile in the AFLW we saw an increase in scoring of nearly a goal per game in 2018 when compared to the inaugural 2017 season. This might take a step back over the next two years as the league expands, but then again, it might not. Of course I don’t mean to pretend that the AFLW’s administration has gotten every decision right either in the past or the present. Mary Konstantopoulos wrote here on The Roar this week on a number of the administrative issues that are holding back the AFLW right now. The apparent lack of promotion, in particular, has been a common recent gripe of the fanbase. AFLW boss Nicole Livingstone talked about this on the most recent episode of the Outer Sanctum Podcast – a must-listen for podcasting-loving AFLW and AFL fans alike – and explained that, to avoid being drowned out by the WBBL and the Australian Open, the competition had more directly targetted the week immediately leading up to Round 1. The AFLW’s advertising presence has certainly ramped up in the past few days, albeit still perhaps still not to the level that we would like to see. Regardless, it’s been frustrating to watch the AFL’s social media channels relentlessly promote a one-night AFLX tournament from more than a month in advance of the event (and to almost unanimously negative response) while only this week beginning to make mention of the imminent AFLW competition. Indeed the fact Kane Cornes’ latest war on brain cells has gained more media traction this week than the launch of a new AFLW season is indicative of the administration’s failure to put the competition on the radar. 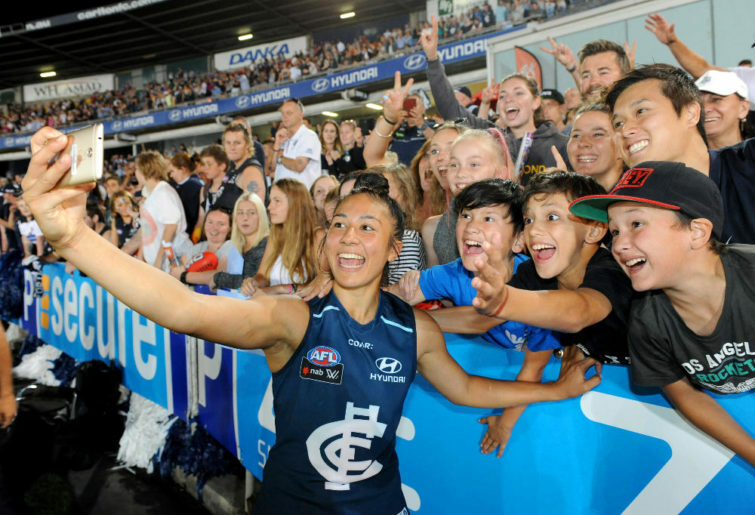 Greater investment is needed if the AFLW is to reach its full potential, but there’s no doubt in my mind that even at the current level of support offered by the AFL’s administrators, it will continue to flourish and grow. Why? The simple answer is that from 27 years of knowing women I’ve learned that their passion and determination inevitably leads to their success, even if they have to fight for it. The sheer fact that the AFLW exists at all is evidence of this. No less than 300 women have fought their way into a national competition in 2019 despite there being little reward on offer but for the chance to play the game they love and to be history-makers. That is a strength of passion you will rarely find. Every step forward that the AFLW has taken has been on the back of the often unsung hard work and determination of women to make their way into a sport so long reserved for men – and that is true not just of players, but also of fans, administrators, coaches and journalists. I believe in AFLW because I believe in women. They are what has made AFLW great, and they are what will keep making it greater. Of course, one of the bad habits of media coverage of fledgling competitions is that we tend to talk more about the AFLW and than just talking about the AFLW – what I mean is, we discuss the success and quality of the league too much, when there’s real football to be talked about instead. I’ll make no secret of the fact that I’m at a new level of excitment for season 2019 and that’s because my team, North Melbourne, is getting a run – and, as previously mentioned, Geelong is entering the league also. The two expansion sides took different approaches to building their respective club lists. Geelong went relatively light on signings from other clubs, with skipper Mel Hickey and dynamic goalkicker Richelle Cranston being the headline acts, instead promoting a large number of players from their VWFL side. It’s expected to be a slower burn for them in terms of building towards premiership contention, but that said, they were runners up in the VWFL grand final to Hawthorn last year, so we know they’ve got a strong group to pull that talent from. North Melbourne went down a more aggressive route of targetting established opposition players, using their long-standing affiliation with the Melbourne University Women’s Football Club to attract a number of former Mugars to their list, including 2018 AFLW MVP and new skipper Emma Kearney. North also brought across former Collingwood marquee player Mo Hope, who despite being a solid performer for the Pies probably hasn’t been the dominant force she was expected to be so far at AFLW level. If a new environment can see her take things to the next level, it’ll be a big win for North. Of the existing AFLW clubs, some were hit worse than others by expansion. Adelaide and Fremantle both emerged completely unscathed, while GWS and Carlton only lost two players each. Collingwood, Melbourne and the Western Bulldogs all lost the maximum four players each, including some of their most valuable, as you’d expect given both expansion clubs were Victorian. Brisbane also lost the maximum four. The Magpies will also lose last year’s Rising Star Chloe Molloy for the whole season to a foot injury, while Brooke Lochland and Isabel Huntington will both miss at the least the first half of the wear for the Dogs. Melbourne on the other hand have some mixed news – they’ve lost skipper Daisy Pearce for the whole season, but the happy reason is that she’s pregnant with twins. 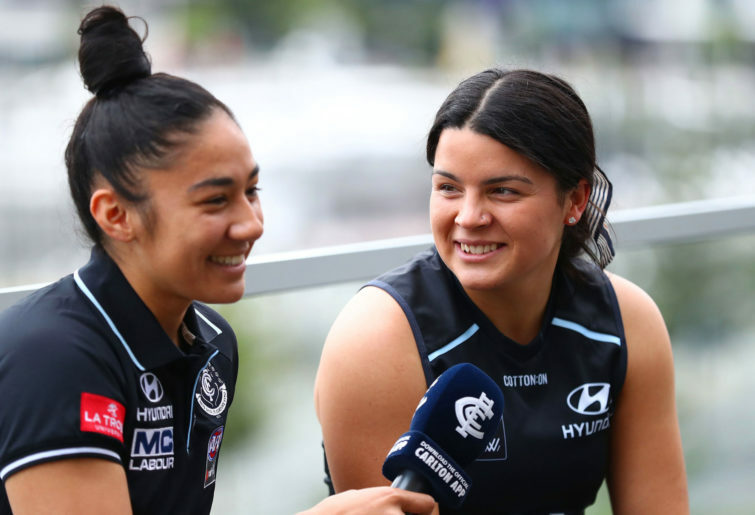 Geelong were handed the first two picks of last year’s AFLW draft, but the AFL’s zoning rules meant the most talented player in the pool, Madison Prespakis, slipped to Carlton at selection No.3. She fills a midfield gap on Carlton’s list nicely, and could have a similar level of impact in 2019 to what Molloy did for Collingwood last year. At this early stage my tip is that Adelaide, GWS, Carlton and North Melbourne will be the clubs that make it to the semi-finals (though it immediately feels like a mistake to discount back-to-back grand finalists Brisbane), and from there anything could happen. I’m pleased to say that we’ll have every match of the 2019 AFLW season live blogged here on The Roar, and you also can expect to see a weekly column from Joel Shepherd on Tuesdays. And of course, this being The Roar, you could be our next contributor! Submit your writing at this link and be the AFLW coverage you want to see in the world.